I haven't really played much of this since breach league (did play the raider version and I prefer the leech from berserker more), but everything is probably still the same.The price of the amulet currently makes it a little less budget though(almost 600c atm in Hsc). Also you should be able to activate cloaked in savagery on demand using Doedre's Elixir. Have fun if you're still interested in playing this and try out other stuff that you think might make it better. Hello ! I haven't played the berserker ascendancy since it was buffed so I decided to play one this league. Though originally this was supposed to be a normal cyclone build I stumbled upon the new Ngamahu's Flame Axe and oh boy...its been so much fun! -Cycloners can kill the toughest bosses and most nightmarish creatures but are easily defeated by one tiny thing.. There are a few different trees to choose from. 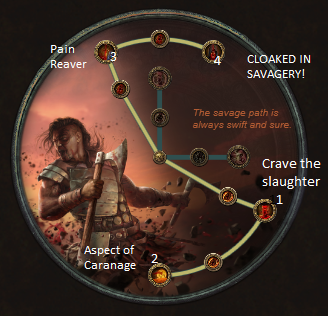 Cloaked in savagery feels so op with vaal pact as it allows you to pretty much facetank a lot of bosses and other mobs but the choice is up to you. Blood magic has about 1k more hp than the non bm version w/ a belly equipped and I had around 7k hp with bm/belly but could’ve gotten more with a kaoms heart. new tree with vaal pact :/ had to get it to liiiivve theese breeaaacch bossess are cray! For the Ascendancy I went berserker because it was fairly new to me and I wanted to play around Cloaked In savagery and vaal pact. A savage hit is a hit that removes at least 15% of the target's maximum life. Damage to energy shield and mana are not counted toward the savage hit threshold. Alternatively you can pick up the Pain reaver node first in normal to get the leech to aid in leveling. You can also choose to go the chieftan ascendancy,It's tankier and has fire resistance and endurance charge generation. What makes this weapon great is that you don't need links on it for it to work.All that matters are the sockets on it since everything you socket into it will get applied to the molten burst effect of the weapon(the molten strike projectiles). 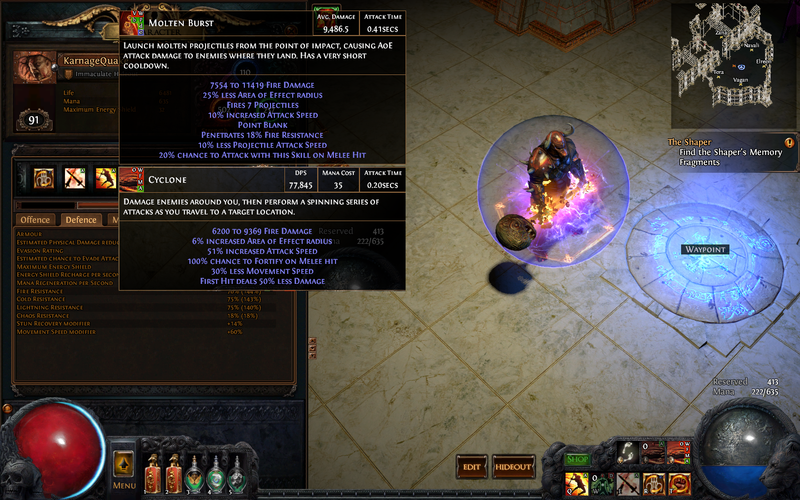 Cyclone can be socketed into a 4 link item as it only serves as a means to proc with weapon's effect quickly but it can do alot of damage on its own with appropriate links. Using gems that scale the projectile greatly,along with the Iron grip keystone we picked up, cause these meat balls do a lot of damage when they hit the floor. Swap conc/inc aoe for mapping and bosses and if you got some problems with landing killing blows you can swap in culling strike instead of gmp for those tough fights but I as I understand the projectile explosions can overlap. 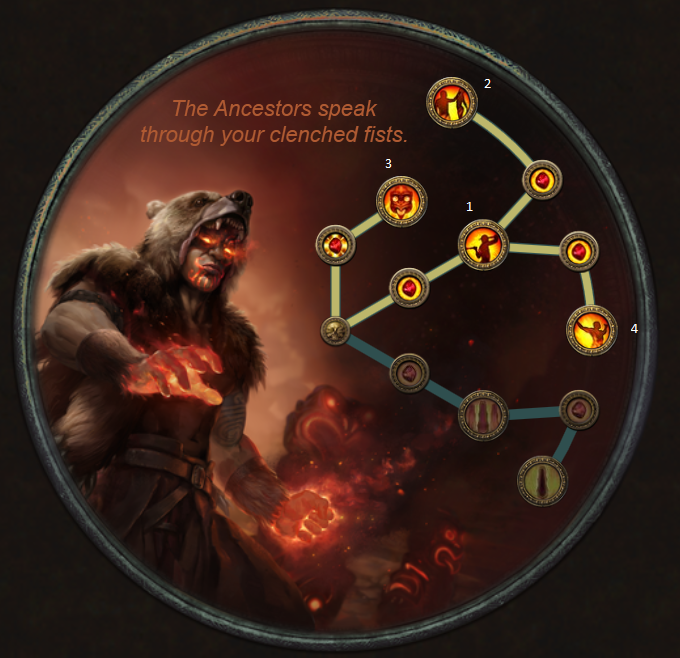 Cyclone's links depends on what passive tree you chose and how many links are at your disposal. Alternatively if you didn't go bm and are using auras and not using a blasphemy you should be able to sustain off the leech from pain reaver! A 3 link will suffice(to get started). The Vaal cyclone/Leap spam setup/remove BM is you have the keystone. You also don't need to use these,You can choose from any auras you want,mix and match-Have fun! FInd whats best for you,GO defensive or pure offensive. There is only 1 REQUIRED item for this build and thats the weapon itself. Without that its just another cyclone build. A Xoph's Blood is a nice late game min-max item but it's not required. Everything else can be just rare with High life and resists! Provides alot of movement speed and attack speed,Perfect for cyclone but not 100% needed. Look for gear with about 80 life/ 50-60 total resists. not all my jewels are optimal. My gear,changed a lot as I experimented with this build. Using Sibyls to survive reflect damage when clearing breaches/mapping and I swap In voideye(recoloring when necessary) to use a defensive aura/purity for certain bosses such as purity for fire for xoph. Leveling is pretty much the same as any melee.I used sunder and Earthquake until I was able to equip the weapon at level 55 and switched to cyclone and never stopped spinning but if you can't/don't want to wait that long you could use a thief's torment ring to help sustain mana until you get the leech for cyclone worked out. Some cool leveling weapons to help you speed through to end game. Your final tree depends on if you wan't Blood Magic/Vaal Pact or Not. Xoph is easy but nevertheless.. This was easy untill I messed up and died. Might try shaper at the end of the league. DISCLAIMER;Please keep in mind that my gear is better than average(wed on rings and belt,almost good jewels) and pretty good overall. Tooltip isn't exactly a good way to determine dps since it doesn't take into account my fire pen(76% from items and the tree and the gem ) and other stuff. Anways,Cyclone in hideout has 77k but my gems are around level 10 currently since I just flipped them to 20 quality*.Easily reaching over 100k in combat with charges. As for the molten burst its was at around 15k(?) but currrently its under 10k because the gems are low level. * If you didn't know If you trade a level 20 gem to a vendor along with a gemcutters prism they will trade you the same gem at level 1 with max quality. -Updated the trees with Vaal pact to a more efficient pathing thanks to kelongngu! Hi, i took a look at your BM/VP tree and made some adjustments. I originally wanted to play Zerker cyclone but decided to play Slayer this league instead. Your original tree would make more sense if you plan to take the build further and pick up Iron Reflexes later. I have an Alien pet. Thats interesting I didn't think about going that route at that time! I am in the process of rerolling into Berserker coming from Raider to deal with my reflect issues and planned a BM/VP tree. Key difference is that I also pick up Point Blank on the tree and add Added Fire in the axe. This is for level 81. 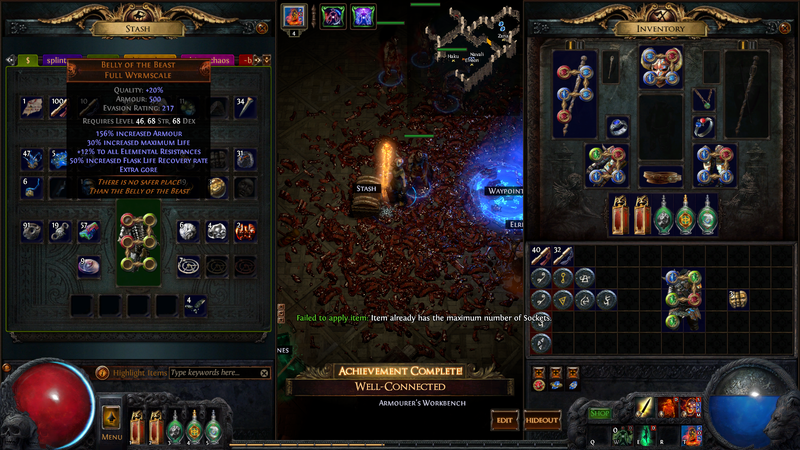 After that I am picking up remaining 5% life nodes and the two point jewel sockets. Potentially I also spec into the Celerity cluster for extra 9% movespeed. Will probably decide when I got to play with it. Here's my planned tree, it's a bit different since I grab Crit and use a Romiras Banquet... I have around 87% chance to hit without Resolute Technique. Fair word of warning: Ele reflect rares can be really rippy under some circumstances. Even with capped res.